In 1985 British Rail London Midland Region staged a number of rail weeks in the West Midlands to promote the railways and get people using local rail services. The Redditch Rail weeks took place between 25th and 30th March 1985 with the key event being an open day at Redditch Station on Saturday 30th March 1985. There were three locomotives on display were class 40 numbers 40013 and 40122 (the only other class 40 on the branch was on the 6th March 1965 when D330 (latter 40130) worked a football special to Alvechurch bring 800 fans from Enfield for a FA Amateur Cup tie with Alvechurch FC) and 58020. The latter gave footplate rides until it derailed in the yard at Redditch. There was also the London Midland Cinema coach showing rail publicity films. 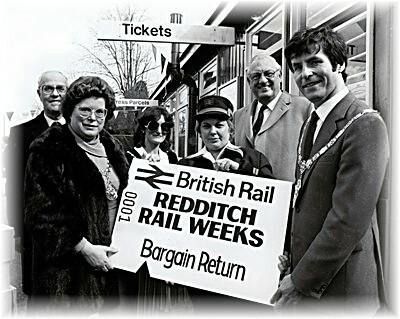 Redditch Rail Week was launched on Monday March 25th 1985 when the chairman of Hereford and Worcester County Council Mrs Joan Hadley bought a special commemorative ticket at the local ticket office. Mrs Hadley presented prizes to the winners of a painting competition organised for Redditch school children by British Rail. 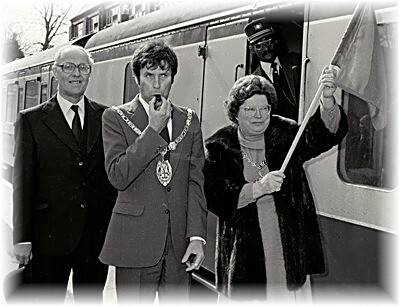 The then Mayor of Redditch Councillor David Walton then waved a green guards flag to signal the “right of way” for the 1122 train to Birmingham New Street and Lichfield. British Rail’s Passenger Services Manager in the West Midlands Brian Johnson was quoted as saying “Hereford and Worcester County Council give valuable support to local services. They sponsor additional Cross-City line trains from Redditch and in conjunction with Redditch Development Corporation and the Borough Council have contributed towards the improvements to the station car park”. The rail week ran for much than one week as it started on 25th March and ran until 4th April 1985. Attractions at Redditch station included Class 40 number 40013 (which at the time was an exhibition locomotive for the London Midland Region and was kept at Tyseley depot) and a cinema coach. On Saturday March 30th there was a open day at Redditch Rail Station where Class 58 58020 provided footplate rides in the yard at Redditch until it became derailed. Also celebrity class 40 D200 (40122) was also on display that day. There were also a number of other rail related displays, rides on a vintage bus and a demonstration of British Rail’s new information computer on travel options in the Kingfisher Shopping Centre. 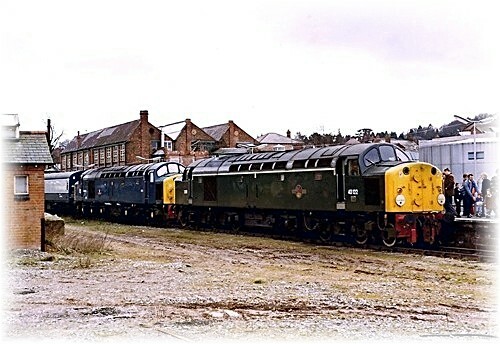 Class 40 40013 was withdrawn from normal service on 13th January 1985 and was retained by the London Midland Region of British Rail as an exhibition locomotive visiting such places including Shrewsbury, Leamington, Kidderminster, Blackburn, Redditch and Southport. It was moved to Vic Berry's scrap yard in Leicester in 1988 for asbestos removal before sale to the late Trevor Dean for preservation. Following his death the locomotive was sold in March 2012 to a group of enthusiasts at the Barrow Hill locomotive sheds where the locomotive is based for continued preservation.